Successful managers possess an understanding of economic and market principles as they relate to business itself. 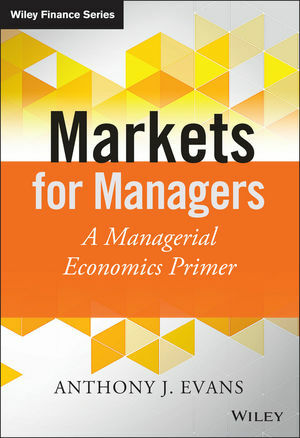 Markets for Managers presents managerial economics in a casual, accessible format that will help management professionals take economic realities into account when running their companies or divisions. The book takes a global perspective while covering the full range of micro- and macroeconomic principles that managers around the world need to know. Complete with online resources that include further reading and a YouTube playlist, this guide puts business management practice within its economic context to produce a practical tool for managers. By understanding market operation and what might cause market failure, management professionals can lead companies that respond to market pressures and align operating strategies with economic realities. Monetary and fiscal policies affect businesses of all sizes, and in Markets for Managers, business leaders can learn how to read the ever-shifting fiscal landscape. The practical format of Markets for Managers is perfect for professionals and students who want to gain an applied perspective on today's most pressing economic issues. ANTHONY J. EVANS, PHD, is Associate Professor of Economics at ESCP Europe Business School. He has taught for ESCP Europe, Cotrugli Business School, Danube University, and Helsinki School of Economics, as well as designing and managing custom programmes. Anthony participated in the Global Colloquium for Participant-Centred Learning at Harvard Business School and was a Fulbright Scholar-in-Residence at San Jose State University. He is a member of the Institute of Economic Affairs’ Shadow Monetary Policy Committee. He received his MA and PhD in Economics from George Mason University, USA, and a BA (Hons) from the University of Liverpool, UK.